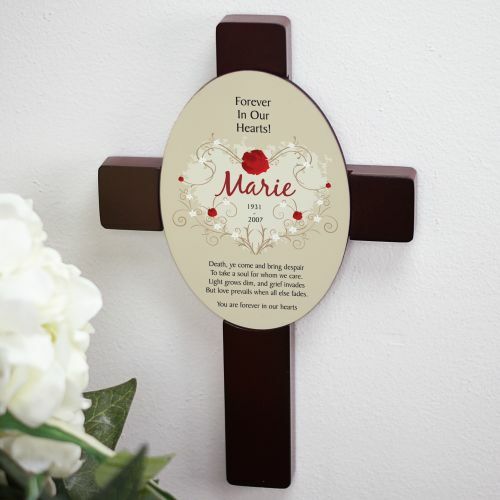 The perfect way to never forget any loved one that has passed is with our Forever In Our Hearts Keepsake Wall Cross Sympathy Gift. 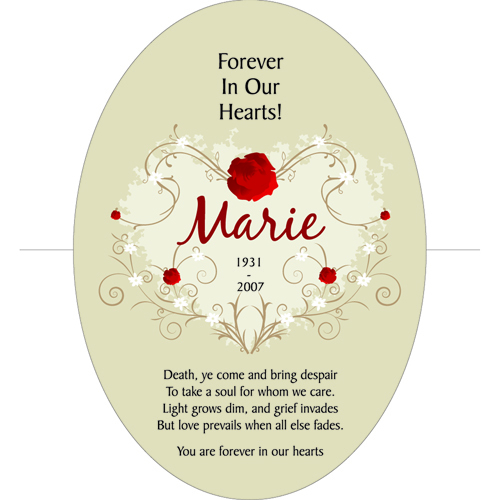 Personalize this keepsake with your loved ones name and birth and at rest dates. Memorial Wall Cross reads: Death, ye come and bring despair To take a soul for whom we care. Light grows dim, and grief invades But love prevails when all else fades. You are forever in our hearts." Our beautiful cherry-finished wood keepsake cross is the perfect way to send warm thoughts and prayers to anyone who is grieving. This is the third Keepsake I have ordered and I have been pleased with them all. Didn't want to give flowers as flowers die , so I saw these crosses and ended up ordering 6 of them . Not only did the recipients love them , many others complimented the great workmanship . Was even nicer than the actual pictures ...will definitely order again . I was very pleased with this product I can display it year around. I also ordered another one fir a family member. In a time of bereavement remembrance of the past is the easiest way to let go. Memorialize your loved ones that have passed with our personalized memorial cross. Losing a loved one is hard to do to, but is a part of life. Our memorial and bereavement gifts will help make your loved ones live on forever. Purchasing a sympathy gift to help someone is their grief is a difficult task. Comforting a friend with loss is the best gift of all. Help them remember their loved one with a sympathy memento. GiftsForYouNow.com specializes in loving Personalized Memorial & Sympathy Gifts. When words just won't do; send a Personalized Memorial or Bereavement Gift to a close, personal friend or family member to express your loving concern and heartfelt best wishes for the entire family.